The voice of this novel is what will catch you. Conversational, confessional, scattershot in the best possible way, it's life at an advertising agency once the economy goes bust and layoffs begin. Told in plural first person, there's no protagonist, per se, just this office of screw ups, eccentrics, jerk offs, strivers, earnest types, and all the usual suspects you meet in a business office. Having just been through an ad agency on it's last legs, I can say this novel is pitch-perfect as the good times all run away while life continues to plod drearily, inevitably downwards. Finished this some time ago, but have been too busy to update much here. Altogether excellent. 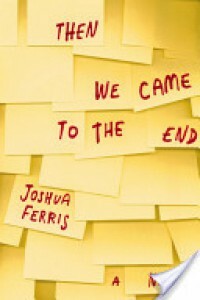 Even up to the last words, Ferris keeps up the impersonal "we" of the narration, and the novel, while having some melodramatic, novelistic elements certainly got the environment of ad agency pitch perfect.